I’ve finally been getting some inspiration to get going on the next installment of the Archetype series – The Dragon. (Lovingly codenamed Russian Guyovitch.) Pictured here is my plotting sheet, before I start filling it out with events (so there are no spoilers, haha). 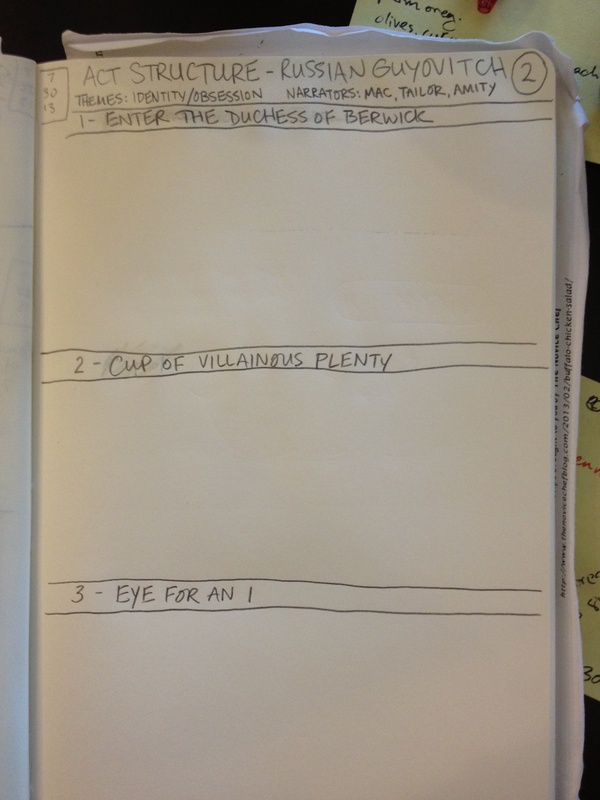 I like having titles for each of my three acts, which, like my books’ working titles, are Venture Bros. quotes. They somehow attach to the theme of the act in some weird way in my head that most of the time I don’t even realize until I’m almost done with the book. (Though act 3 of The Thief, “Something Torrid,” was a very deliberate reference to Meredith setting stuff on fire.) These act breaks and titles don’t make it into the actual book, they’re just for fun, and to help me break things down into manageable parts in my head. But I figured I could share them here. You can expect a lot of variation in narrators in the rest of the series. I’ll try to limit it to 3 major narrators per book, but expect them to change out. I get bored staying in one head too long. Besides, with each book, there’s different people at the center of things, and I don’t like forcing characters to be present for events where their presence makes little sense. No, I’m going to pick the three people that are going to see the most action, and those are the perspectives we’ll hang out in. You might just find yourself a new favorite character in the process. Heck, I’m certainly having that experience. I’ve got some really fun stuff lined up. Please stick around. Tags: alpha draft, Archetype, Camille, DRAGON, Mac, structure, writing. Bookmark the permalink.